Have you ever wanted to create beautiful night photos but it was completely dark when you found the right spot and subject? 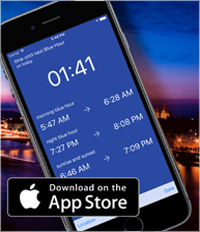 Well the bluehoursite.com web site will help you by calculating the best time frame for taking stunning blue hour pictures. If you don't know what is "blue hour" then you're in the right place. It refers to the time after the sun goes below the horizon and the sky goes into deep blue for a while. This is the best timing to take photos. You can learn more about this in the articles section by reading the tutorials. Join to the Blue Hour Flickr Group and add your best images to share it with other fans of the blue hour and night photography on this site.